NJ Paleo Girl: Paleo Lent- Week #6: Meet me in San Francisco! 2. Stir in bell pepper and tomato paste stir for 1 minute. 5. While stew is simmering, hack crab leg through shell into 2- to 3-inch pieces with a large heavy knife. 9. Discard bay leaf, then return clams to pot and gently stir in parsley and basil. 10. 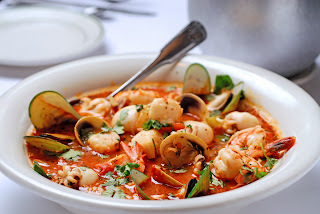 Serve Cioppino immediately in large soup bowls. Note: The stew — without seafood — can be made 1 day ahead. Cool, uncovered, then chill, covered. 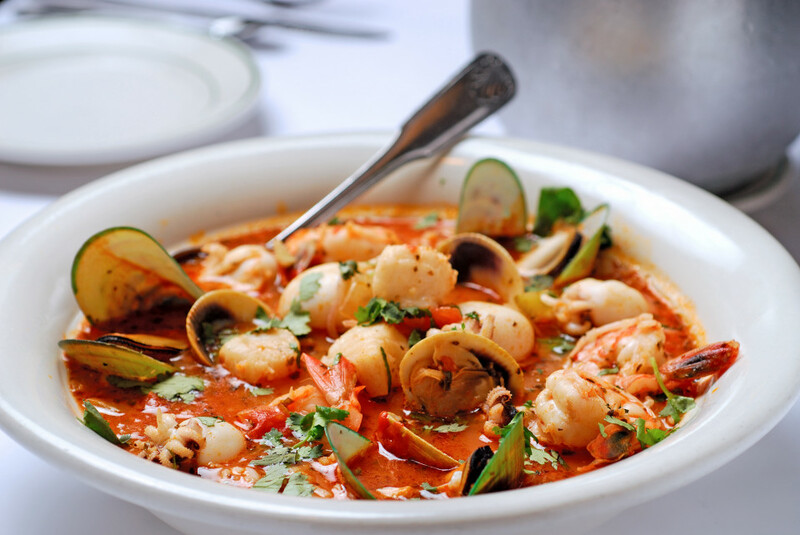 Bring to a simmer before adding seafood. This looks amazing! We're heading to Cali for about eighteen weddings this summer and will be making a stop in San Fran. I'm quite excited because I've never liked seafood, but I've been more adventurous lately and have promised myself to try lots of new seafoody stuff all summer long. (I'm riding high on my delicious scallop lunch today - my first!) Also, I saw that double yolker on your "What I'm Eating" page and I'm extremely jealous - I hoped I would find one by now, with all the fresh eggs I've eaten over the last five + years. No luck! So glad to hear you're trying seafood, it's delicious! Also- that was my second double-yolker!! In the first two months of eating Paleo... it was unreal. They both came from Fairway's organic cage free eggs. I ADORE THIS STEW! I never make it for myself, because I am just one person and I would make enough to feed a family of 10... but when I go home my father makes it sometimes and boy do I get excited! I especially love sea scallops in it!